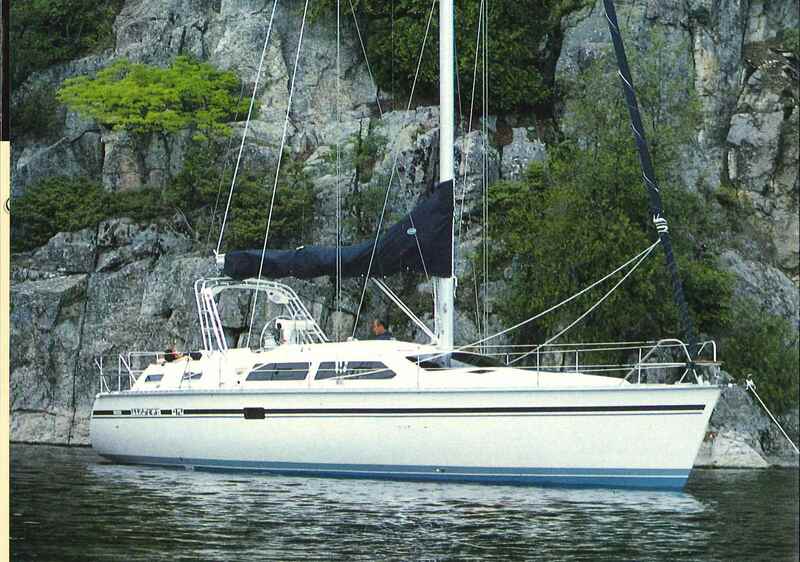 TANDEN a 42 Hunter Passage 1991 is new to the market. Just listed for sale. She is located in Merritt Island, FL. Asking $109,000. As you descend the companion way you enter the large main salon with beautiful oval dining table and wrap around settee to port. The main salon provides lots of storage outboard and a hanging locker just aft of the wrap around seating. To starboard is a comfortable settee with additional storage outboard. The large forward and side facing windows provide a bright spacious feeling with great visibility. Just aft of the starboard settee down one step is the spacious galley with centerline double sink, three burner stove with oven and Adler Barbour 12 volt refrigeration, one freezer and one refrigerator. A new microwave was added in 2009. Lots of storage and Corian counter tops. Aft and to port is the outboard facing nav station. Aft of the nav station you enter the spacious owner’s cabin complete with settee and separate shower/tub, electric head and lots of storage. There are eight opening ports and a deck hatch for unsurpassed ventilation. Forward of the main salon is the VIP cabin with large V-berth a pair of settees, drawers and hanging locker. A large deck hatch provides good ventilation. The forward head is just aft of the v-berth to starboard with electric head and separate shower. Contact George Eberhard (317) 517-4666 for details.